Although the primary goal of the GlobIce project was to monitor sea ice dynamics in the Arctic Ocean, the GlobIce processing methods can also be applied to many regions of sea ice in the Southern Ocean surrounding Antarctica. Sea ice dynamics in the seas around Antarctica are historically even more poorly observed than in the Arctic due to its extremely remote and inhospitable location, which make in situ measurement much more difficult. Antarctica also has a very different geography to that of the Arctic; Antarctica is a continent surrounded by the Southern Ocean, whereas the Arctic Ocean is an almost-enclosed sea. Sea ice around Antarctica is known to be significantly thinner - typically less than 2m thick compared to 2-5m in the Arctic. It is less ridged, and subject to higher drift velocities and greater snow cover than in the Arctic. Heavy snow cover can cause thin sea ice to sink below the water surface. 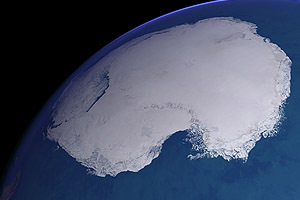 Certain regions of Antarctica, such as the Eastern coast, have a relatively narrow band of relatively thin sea ice which is difficult to monitor using existing techniques of active or passive radar image comparison. However, in large parts of the Weddell, Ross, Bellinghausen and Amundsen Seas, ice tracking is mainly successful and can produce a potentially very useful set of high resolution data products, particularly given the lack of other current Antarctic data sets. The GlobIce project produced a prototype data set of two months of Antarctic products for August and September 2009.